Hey – No warning ? A client I’m at runs IE 8 on their image, and unfortunately no other browsers and I can’t get to your site to do the necessary work I need to do today. @JP: tell your client they need to upgrade. XP LTS has expired and IE8 users are a very very very tiny fraction of users nowadays. Yea – we get that. I wish I had the pull in a 60,000 user company and a little security guy 🙂 It’s Win 7 though. Some corporate app they are trying to update…. @JP – when you open regexr.com in IE8, you should see a message letting you know your browser is not supported, with a link to RegExr v1 (as long as you have Flash installed). Let me know if you’re seeing something else. it does – I love the new version – just threw me for a loop this morning. I totally encourage you to keep updating. I’m just being squeaky! Sorry mate. Really nice, Great work! looks like I’ll be switching from regexpal. That is amazing! I was still using regex v1 from time to time. Thanks for the update!!! Very nice. One feature request: you need a switch to toggle the context help on/off. If you don’t need it, it’s somewhat distracting while editing. What is the reason that the latest Opera (version 12.16) is not supported? 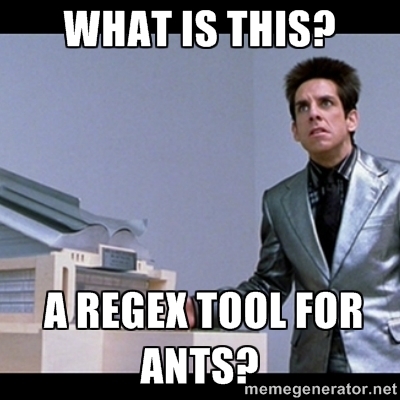 I still use RegExr 1 frequently in my work flow. However, I use the desktop version. This looks like a great update. Any chance we will see a desktop application version of it? @Nate – yes, we are currently looking at different wrappers and plan to provide a desktop version eventually. I like the change but would really like to get rid of the menu on the left side, it just takes up too much space and is distracting to the focus which should be the editor. Thanks for all the time and energy in the software. Nice, looks and feels great! Request: please keep the older Flex based one around… as much as v2 is awesome, when I’ve needed a RegExp in AS3 land RegExr became my goto because it uses the AS3 Regex engine, so I knew what I saw is what I got. When doing Regex for JS there are lots out there, but RegExr v2 is top-notch and most welcome for JS work. What a great project. Learning regular expressions is easier than ever. I would like to suggest some new features. After saving a regular expression and sharing it with the community it would be nice if I could edit it again. I know that you have 24 hours to update it in the database. Looks great. May I ask why the dotall (s) flag was not included? as it proved useful for me in the past. @Harris – you should be able to update your pattern for 24 hrs. After that, you will have to save it as a new community pattern. This is to prevent issues with people favouriting a pattern that works for them, then having it break for their use case when it is edited. @adl – Unfortunately, dotall is not supported in JS. Instead you have to use a [\s\S] set. [^] also works for all modern browsers, but unfortunately not for older versions of IE. @Chris – did you run npm install? yes, that part went without a hitch, the grunt build part is where it errors out. Hello, if there a chance to do it multi language. I like to see this in Spanish. I can help with the translation. Good to see a new version! I’ve been using v1 desktop version for a long time now as part of my coding work routine, so I’d love to see this new one as a desktop app! Just wanted to leave a small comment to say a huge thank you for such an amazing tool. I use it all the time for my regex needs. It’s fast, responsive, smart and very well designed. Kudos to you and thanks for making it open source as well. Thanks; this version very nicely.